This property is for those desiring a true mountain getaway vacation but with enough amenities to provide for a comfortable retreat. 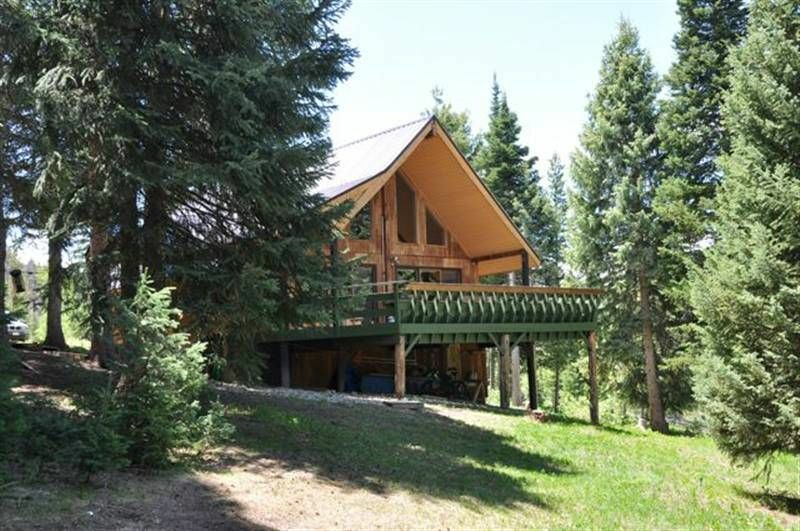 The cabin is cozy yet roomy, is rustic in feel but has ample modern day comforts, offers great privacy but is one of the closest properties to Steamboat Lake and National Forests. The expansive deck provides extensive outdoor living space with a breathtaking view of Hahn’s Peak. Check out our semi stadium seated fire pit ideal for camp fire dinners and marshmallow roasting. Children will love the numerous “on property” activities including an outdoor “kids cabin”, playing horseshoes below the deck, our over-sized swing, and mountain biking on our trail. And when the family is ready to explore the surrounding areas finest attractions and recreational activities you won’t have to go far. The cabin is situated on 2 acres of wooded forest directly across from Steamboat Lake State Park and adjacent to National Forest where there are over 1 million acres of US Forest and State Park land at your disposal. You can walk to the lake following the Mill Creek Trail (about 0.5 miles) or take a 5 minute drive to Meadow Point on Steamboat Lake or continue a few more minutes and be at the marina. USFS access is directly behind the cabin or by USFS Road 42 about 0.25 miles from property. A den of four fox currently resides on the property and deer and elk are also frequently seen. Bald eagles, Great Heron, ducks, hummingbirds and Sand Hill Cranes are all present in the area. Your cabin also includes use of equipment to make your vacation memorable from our 2 seat kayak to mountain bikes to horseshoes to fishing equipment. Remember, this is also our vacation get away and is primarily used as such so we have a number of items available for use that are not listed. Make sure to call or email and we can address any specific vacation goals you might have. This is not a high volume rental property, we only rent a few times a year and no more than once in any 30 day period, and are looking for families wishing to experience this magical area of Colorado who will look out after our place. No partiers please. The cabin is a family owned vacation getaway used by everyone from grandparents to grandchildren. We are 3rd and now 4th generation Coloradans who have spent considerable time in the Colorado outdoors and competing in various sports. Within our group of families we have a former multi time national Triathlon champion, former number 1 ranked Colorado volleyball player, 2 former freestyle skiing competitors, former state ranked tennis players, a junior 5k national champion and a grandmother who has hit 5 hole in ones! Note the extensive use of the word 'former' above. We are now working professionals with devote commitments to our families and children. We spend way too much time in an office and not enough at our cabin. The cabin is our escape from everyday life, a chance for the kids to get away from electronics and experience what we did as children, and an opportunity to escape the heat of summer and the crowds of winter. For families looking for this opportunity, we would be delighted to host you. The combination of location, charm, practicality and value are the extrinsic reasons why we purchased this cabin; however, it was the more intrinsic attributes such as lifestyle, surrounding beauty, and abundant recreational activities that ultimately made the decision quite easy. The benefits of having both a wilderness experience while still having plenty of comforts really sold us on this cabin. It was important that the kids had enough to do on property or within walking distance that they weren’t bored waiting around for the various families to get organized to drive everyone to a destination. Further, we recognized that we have family members with distinctly different interests so location would be essential. For instance, I love to fish but my youngest son does not. I can fish Mill Creek (just across the road from the cabin),or walk to Steamboat Lake while my son rides his mountain bike, builds forts on the property or explores the National Forest behind the cabin without any of us needing to get in a car. And when we do go for family adventures most are located very close to the cabin. On father’s day, three dads got up early and hiked to the summit of Sand Mountain. We were at the summit within 1.5 hours of the cabin. Fishing in the evenings is fantastic at Steamboat Lake with kids getting plenty of fish. Mountain biking on the USFS access puts you into unbelievably beautiful country within minutes. We can kayak and fish Steamboat, Pearl and Hahn’s Peak Lake within 10-15 minutes. Nature hikes including one of the State’s top ranked short hikes, a marine, visitors center, and bike paths are all within minutes of the cabin. In winter, you have cross country skiing, snow mobile riding, and snow shoeing to name a few. We will be doing snow kiting this winter as well. You can also make the 45 minute drive to Steamboat Ski Resort. This is a place where the kids won’t want to leave and neither will the adults. Charm – a perfect blend of a rustic mountain cabin with enough modern day amenities to make your stay comfortable. Location – Tremendous privacy yet exceptionally close to the area’s finest attractions and recreation. Packages – Not only do you have use of our cabin, but to many of our “toys” as well. On site activities – Enough to do the property to keep kids and adults happy. Wifi - Download speeds are suitable for some browsing and checking email but not for viewing movies. Expansive deck with views of Hahn's Peak. Bench seating and ample room. We had 4 guys stay in the cabin for a long weekend of snowmobiling. The cabin worked great for us and we grilled 2 of the nights with the weber on the deck. The property is a beautiful, secluded getaway that is well-appointed and comfortable. The view is spectacular and the wildlife makes you really feel part of nature. It is exactly what you think of when someone says "cabin in the woods". The hosts go out of their way to ensure you have a pleasant experience, and they have provided all kids of outdoor gear to help make that happen. Our family had a wonderful mountain holiday and we would return in a heartbeat. Our kiddos had the best time, as did the adults! If we are lucky enough to get to rent here again, we will stay longer! Comfortable and relaxing and just an overall really nice trip! Thanks so much to Dave and family... we enjoyed our vacation enormously! The area around the cabin is probably the most beautiful setting in Colorado. The cabin was so comfortable. We really appreciated how well-appointed it was. I wish we could have stayed longer! We hope to be back ASAP! Spent the first week of November here 2017. Snowed early during the stay and then temperature dropped below 10 degrees. The cabin was very comfortable, and roomy enough for 4 adults and our gear. Great kitchen, roomy den and a very nice wood stove. The property is well cared for and designed for recreation. Looking forward to returning with the family in the summer to enjoy all the local hiking, fishing, boating and exploring the National Forest! The cabin is in an incredibly beautiful spot, and supplied with more than I expected it to offer. This location abounds in variety of activities, scenic views and drives. The development of Steamboat Ski area for mountain biking is great. Watch out for the open-range cattle wandering around the neighborhood, and the cowboys and their dogs herding them down the roads . We appreciated the use of the kayak and paddleboard. This is a wonderful place to visit. Steamboat Lake State Park, Pearl Lake State Park, Zirkel Wilderness area, over 1,000,000 acres of National Forest to explore.